Samuel and Jacob Kart Racing: Cheshire Kart Club - August - Top Novice Again! 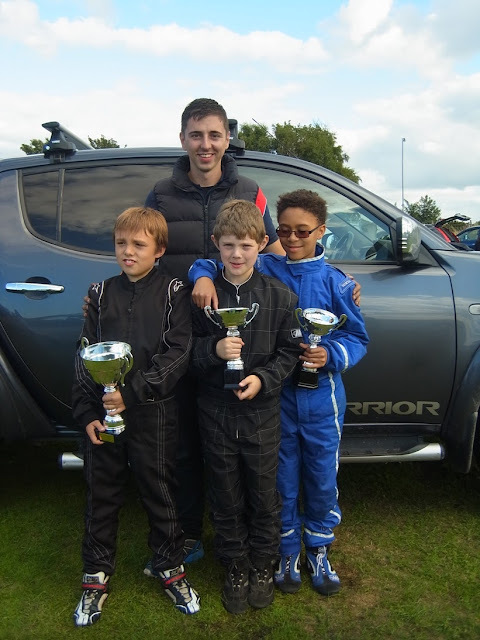 Samuel took top Honda Novice again at the Cheshire Kart Club on 18 August. He set a 43.77 lap in the first heat after starting 11th on the grid and finishing 11th out of the Hondas and Comer Cadets. Heat 2 he did a 44.19 and finished 8th overall (3rd from 5 Honda's). And in the final he went quicker and set a 43.87 finishing 3rd overall in the Honda's and top Novice. Not his best time but still good enough to get on the podium and to take away a trophy! He now has just one Novice race left before he can race properly and not start from the back each time. Three of the boys came away with trophies - Garrett in first place for IAME and Alex with top IAME Novice - and they are all with Ryan from CKS. Next race is 25 August!